The militarization of Europe has been gaining momentum for almost two years, but the political and social debate about it is as good as absent. In the parliamentary committees Foreign Relations and Defense are very sporadically devoted to a question, but on a well-substantiated discussion, let alone an opposition vote, it is still waiting. For the Belgian political establishment the theme is unknown territory. However, European decision-making on militarization has far-reaching consequences for the national defense budget, especially for military investments, the use of taxpayers' money for military research and the transformation and deployment of the army. In the summer of 2016, Federica Mogherini states, the High Representative for the Common Foreign and Security Policy, a 'Global Strategy of the EU'. The "EU must be strengthened as a security community" that's how it sounds. The strategy must enable Europe to operate more autonomously. The European leaders have not allowed grass to grow since then. At the European summit in Bratislava (September 2016) they decide to give a new impetus to foreign security and defense. They approve a plan with three strategic priorities: 1. answers to external conflicts and crises, 2. the development of the capacities of the partners and 3. the protection of the European Union and its citizens. Several concrete programs are being set up, including CARD ('Coordinated Annual Review on Defense'), which aims to improve defense cooperation between Member States and PESCO ('Permanent Structured Cooperation') for those Member States that want to go further in defense cooperation. PESCO is welcomed as the embryo of a European Defense Union. Already in the Treaty on European Union, Article 42.6 states: "Those Member States whose military capabilities meet stricter criteria and which require far-reaching commitments in this area. with a view to carrying out the most demanding tasks, establish a permanent structured cooperation within the framework of the Union ". The term PESCO already has a place in the Treaty of Lisbon (2009), but it has led to a dormant existence for a decade. A number of international developments provide the Military-Industrial Complex with the ideal arguments to finally bring PESCO – "sleeping beauty", that is, European Commission President Jean-Claude Juncker to life. One of these is the changed security environment. Donald Tusk, President of the European Council, writes in the run-up to the informal meeting of heads of state and government in Malta (February 2017) an open letter in which he lists a number of threats: "an assertive China, especially at sea; Russia's aggressive policy towards Ukraine and its neighbors; wars, terror and anarchy in the Middle East and Africa, in which radical Islam plays an important role (…) ". In addition, the ever-Eurosceptic Britons are about to disappear from the EU, so they can no longer be bothered by autonomous European militarization. The arrival of Trump at the helm of the US and his statements about the "outdated" NATO also give European militarization a boost. Europe needs to step up its efforts to modernize NATO, according to the US President. But also the distrust towards Trump is used as a plea for a militarily autonomous Europe. Trump does not really matter. Even before his presidency, a joint statement by the EU and NATO (July 8, 2016) sounds that "a stronger NATO and a stronger EU mutually reinforce each other". Less visible are the interests of the European arms industry as the driving force behind European militarization. This industry is struggling with growing competition in the global arms trade market, but also wants to be better able to compete with the powerful arms industry of the US, especially in view of the large military orders that the European member states are planning in the coming years. The recent militarization process was started under the leadership of France and Germany. On 11 December 2017, the European Council decided to establish PESCO. All European member states, except Denmark, Malta and the United Kingdom, take part. They commit themselves to a whole list of strict mandatory criteria. For example, the participating member states must "regularly" increase the defense budgets. 20% of that defense budget must be used for military investments, a standard that has already been agreed in a NATO context. 2% of the national defense budget must specifically go to military research and technology. Furthermore, measures are being taken to improve defense cooperation within the EU, with a central role for the European Defense Fund. This is an initiative of the European Commission that wants to stop 500 million euros in Defense research from 2020 and also creates a financial instrument for joint military investments worth € 5 billion a year. Other agreements include the availability and deployability of the troops such as the 'EU Battle Groups'. The 25 PESCO countries must each define their commitments in a National Implementation Plan. The implementation is assessed annually in a report so that it can be adjusted. This means that Member States have little room for maneuver and have to adhere to norms with large budgetary and military-strategic consequences. The contrast with the strict budgetary and saving policy for national budgets, which the European Commission requires from the member states, can not be greater. At the beginning of 2018, the Council decides to start 17 projects on which the PESCO member states have reached agreement. These are projects related to training, asset development and operational preparedness. A different group of countries always takes part in the projects. Belgium participates in 6 projects and takes charge of the project for maritime mine control. Although PESCO has to push the European nose of the member states further in the same military direction, the principles of its protagonists are different. the former colonial power of France, which wants to translate its own political security objectives into the whole of the European Union, the priority clearly lies on the strengthening of the military capacities to be able to carry out interventions in the southern zone (Africa, Middle East). Because PESCO does not live up to that expectation and is based too much on German language, President Macron has launched the idea of ​​a European Intervention Initiative (EII): a joint military force with a common military culture, doctrine and budget, which can be found in EU or NATO connection, but can also act independently. How such an EII must relate to PESCO, NATO or the already existing multinational European Battle Groups is still a mystery. Germany, which was previously motivated by the idea of ​​a real 'European Defense Union', is not very keen on on the French focus on a military intervention force. Berlin is rather hesitant about a scenario in which it would be mandatory to expand the presence of the Bundeswehr in Africa and the Middle East. Germany is more interested in improving military industrial cooperation within the EU, which can not by chance be advantageous for the German arms industry. Although the Eastern European member states participate in PESCO, their attitude is rather skeptical and suspicious. They have less sympathy with the threats associated with North Africa and the Middle East and have different security priorities. Moreover, they see PESCO as particularly advantageous for the well-developed arms industry of the major European countries, particularly France and Germany. Poland, the Baltic states, but also Romania look more to the east where they feel threatened by Russia, a perception that is eagerly nourished by the United States, also within NATO. Poland has become a pivotal point for the military activities of the US on the European East flank. At the beginning of January 2017, the largest troop deployment in Poland started in decades with the deployment of some 4,000 US combat troops (spread across various military bases) in NATO, as part of the European Enforcement Initiative (EDI) against Russia. Washington's relations with the Eastern European region have never been so intense before. EDI was established three months after the Russian annexation of De Krim in 2014. Since then, the budget for EDI has grown steadily, both under President Obama and under President Trump. 3.4 billion dollars have been allocated for 2017. For 2018 and 2019, 4.8 billion and 6.5 billion dollars respectively are foreseen. The European military engine is running at full speed. 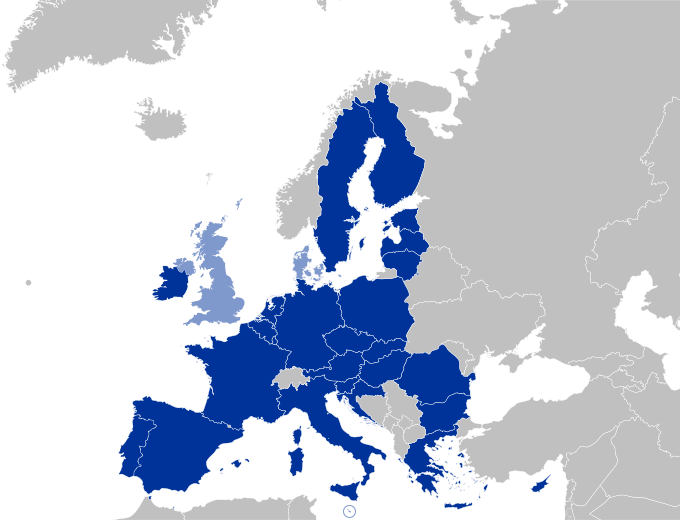 PESCO is complementary to the European Defense Action Plan of the European Commission, which resulted in the creation of a European Defense Fund (see above). This fund must encourage investment in the defense industry and strengthen the single market for arms trade. The proposal for a Development Program for a European Defense Industry is expected soon. A majority in the European Parliament welcomes all this in a resolution, and even wants to go a step further here and there, for example with the effective introduction of the 2% standard (of the Member States' GDP) for military expenditure. Never before has the Military Industrial Complex in Europe been served up to its liking.